One of Pokémon Sun and Moon's new features will be the addition of Z-Moves. Z-Moves are a new type of attack that can be activated once a trainer finds the Z-Ring accessory and the correct type of Z-Crystal for the Pokémon they want to use a Z-Move with. For those trainers wanting a little bit more immersion in their Pokémon Sun and Moon experience, Tomy is releasing a physical Z-Ring accessory. The real-life Z-Ring will light up, make sounds, and vibrate to match what's happening in game. 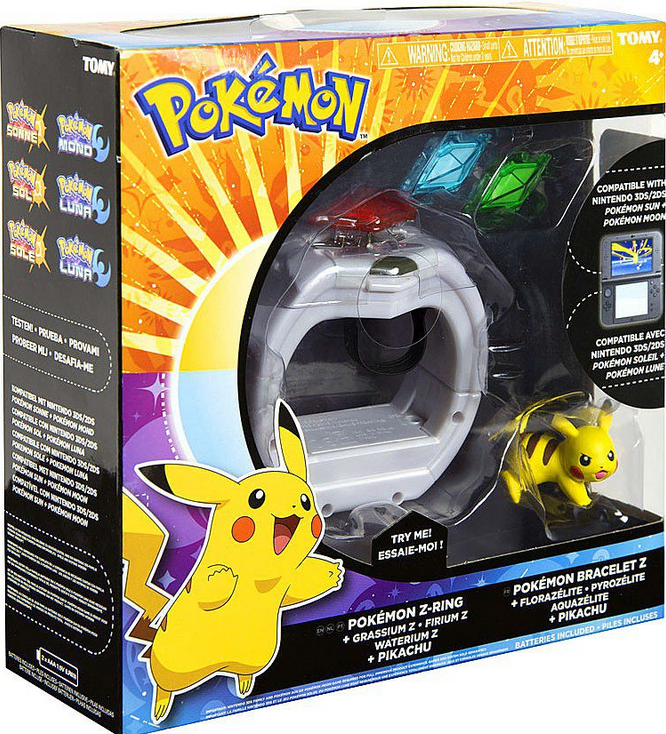 The base set will comes with a Z-Ring, three crystals associated with Grass, Water, and Fire-type moves, and a Pikachu figurine. Other types of crystals will be sold separately in three packs. If you want to take your Pokémon experience to the max, then you can buy the real like Tomy Pokémon Z-Ring, available when Pokémon Sun and Moon launch on November 18 on the Nintendo 3DS.